We celebrate Advent as a season of Good Tidings of Great Joy, but there’s more to that reality. God purposefully chose to send his only son, Jesus, to live among us knowing the dark and painful realities that lay ahead. There would be no reason to celebrate at all if weren’t for God’s intervention – the birth of “The” Advent – into a world full of broken, “weary and burdened”…and desperate people. That came back full force when I decided to look back at past journal entries for December 14 and found this startling and heartbreaking event from Advent, 2012. Sandy Hook broke many hearts then, including mine. I wouldn’t have chosen the memory of that massacre for this Advent but sometimes it’s the gaps in a broken heart that make room for remembering the reality of why “The” Advent still matters today. Come into my heart Lord Jesus. Romans 8 is encouragement “for those who are in Christ Jesus.” It’s a good plan, designed to redirect our focus away from the necessary consequences of God’s disapproval because of the rules we could not keep, to “sending His own Son in the likeness of sinful flesh” to become the living example of a new option. That Advent changed our focus completely. Jesus’ birth is the fulfillment of God’s promise to redirect our focus so “the requirement of the Law might be fulfilled in us, who do not walk according to the flesh but according to the Spirit.” It’s more than celebrating the historical birth of Christ “His”story has become our story too. That’s worth celebrating year after year! “Let us…our image, in our likeness;” are phrases of the reality of Christ’s presence, not just at our Christmas or Advent celebrations but at the beginning of all life. He was there when the stage was set for mankind: water, light, sky, vegetation, stars, living creatures…and finally…Adam. He saw firsthand what a new creation looked like and it was good. It was a perfect preparation for that future day when he would open his eyes in a very different place, a cradle, and a new beginning. Even though people might not recognize him, he would still see the likeness of their creator in them and in that image they bore the possibility of a new beginning…and it was good. 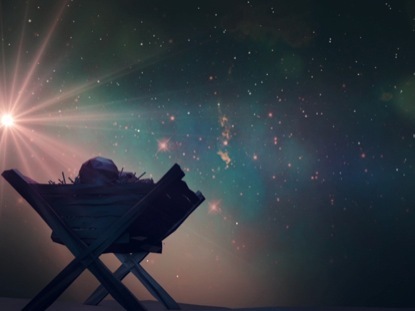 Those images we see of that divine baby during Advent remind us we are image bearers of our creator but that likeness always starts with a new beginning. While our eyes are focused on him, he sees that likeness in us and that is good!